While the average price of utility-scale solar is now under $1 per watt and below 6 cents per kilowatt-hour, almost unthinkable just a few years ago, the cost of solar must come down even further in order truly to be competitive in the marketplace (without subsidies). We1 believe the best approach to lowering the cost of solar electricity further is to increase cell efficiency because this lowers the “balance of system” (BoS) costs, such as installation. Higher efficiency solar cells means that fewer panels (and surrounding materials) are needed and costs come down dramatically. This can be done by manufacturing ”tandem” or heterojunction solar cells made of a very high quality semiconductor thin-film deposited on an inexpensive substrate, on which an even thinner extremely efficient semiconductor film is deposited. These two layers combined, also known as a “tandem” design, can potentially achieve efficiencies as high as 30% (the current record efficiencies of modules in the market are around 25%). And our manufacturing process is simple and uses common processes well known in the semiconductor industry (display industry). Specifically, our “kerf-less,” modified liquid phase epitaxy technology allows for the growth of continuous (single crystal or highly textured, large grain) semiconductor ultra-thin films on ordinary (soda-lime) glass on which materials such as perovskites, or III-V compounds, are then deposited. All our core technologies are now patented and can be easily found online. Higher light conversion efficiency (due to single crystal, or high texture and large grain). Less semiconductor material use (due to thin-film and inexpensive substrate). Low temperature film deposition while still allowing for high quality material (due to eutectic manufacturing method) allowing for deposition on flexible substrates such as plastic. A tandem (perovskite/silicon thin film for example) solar cell structure that could achieve efficiencies of up to 30% (in theory as high as 45%). 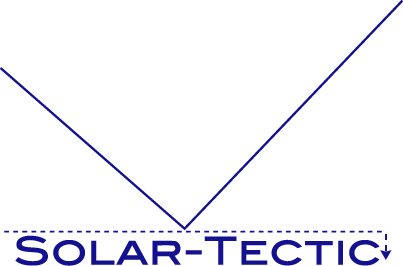 In addition to solar cells, Solar-Tectic™ (ST) has proprietary technology and know-how for a variety of other electronic devices which are closely related from a materials science point of view. For example, ST recently announced breakthroughs for its Field Effect Transistor (TFTs, FETs) technology used in displays. Very high mobility TFT material, made at low temperature, was demonstrated for the first time using our patented technology (see News section). ST has recently received a patent for ceramic glass (sapphire), consisting of a thin layer of sapphire (crystalline Al2O3) on ordinary soda-lime glass or other kinds of glasses. This product is being developed for use as a substrate for deposition of highly oriented semiconductor films for LED purposes, as well as for display applications like covers for smartphones, etc. where hardness for anti-scratch is needed. Solar-Tectic™ also holds proprietary technology for LEDs, OLEDs, and OLETS and a variety of other optoelectronic devices such as microLEDS and laser-diodes. Solar-Tectic™ derives its name from the word ‘eutectic’, a fascinating physical phenomenon occurring when two elements — such as silicon and a metal – are combined to form an alloy. Many of our patented technologies, such as ‘1c-Si Eutectic’, and ‘1c-Si Laser Eutectic’, and tandem solar cells take advantage of this phenomenon for low temperature deposition of films and with excellent material quality applicable to solar and displays. (Our process is not the same as traditional metal induced crystallization (MIC)). We are currently conducting intensive R&D in many of the above areas. Solar-Tectic LLC is one of only three companies in the US that are actively developing perovskite solar cells, and probably the only US company that holds exclusive IP (5 patents). 2 See “The Future of Solar Energy: An Interdisciplinary MIT study”, copyright MITEI, May 2015.